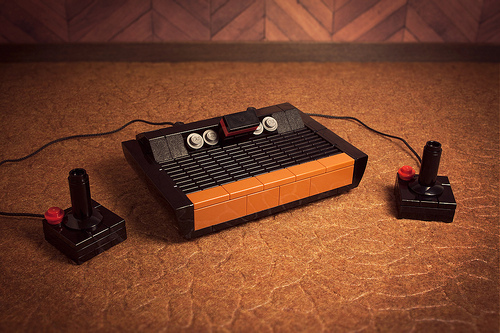 See Keith Goldman's LEGO models on Flickr. 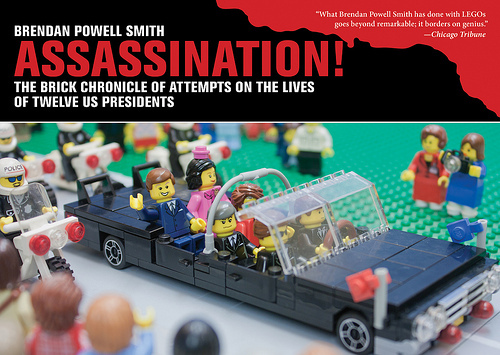 Brendan Powell Smith takes a break from biblical action with a new tome released just in time for the holiday season that features great building and a heaping helping of the darker side of American presidential history. The book is entitled Assassination! 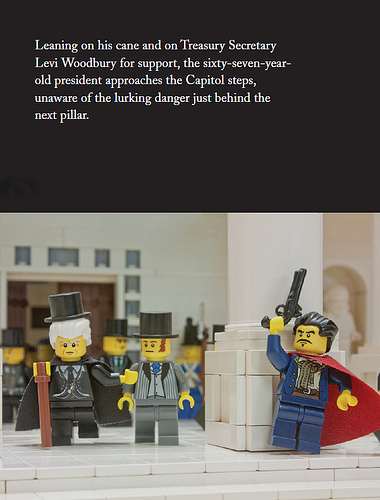 The Brick Chronicle of Attempts on the Lives of Twelve US Presidents and it is now available through the link or from the usual suspects who still cater to those of us who enjoy a hard copy. Brendan is an old crony of mine who sent me a free personalized copy of the new book knowing full well that I wouldn’t be able to keep my big mouth shut about it. The first thing I noticed upon grabbing it from the mailbox was its satisfying heft and a larger format than the Brick Testament editions riding the bookshelf in my Legoratory. The book clocks in at 272 pages, features over 400 photos and retails for about $15 here in the States (depending on how you order it) and you can get a signed copy for about $20. Brendan’s building has come a long way since the first edition of The Brick Testament some ten years ago and I think it’s fair to say he’s on top of his game in this book. Creating 400 scenes without getting burned out or taking short cuts seems like an amazing accomplishment to me so I found that the actual quality of the building exceeded my expectations. What I enjoyed most however, was the writing and the depth of information that Brendan provides on each assassination attempt while maintaining a smooth narrative flow. Being a history buff, I thought I was pretty well versed on the topic going in but in each of the 15 accounts (Lincoln, Kennedy and Ford get 2 chapters each) I definitely walked away with more knowledge on the events than I had going in. My favorite chapter of the book was actually the first one which detailed the 1835 attempt on Andrew Jackson’s life. Brendan has always had a knack for selecting just the right minfig for the right character, but never more so than with Old Hickory. There are a couple of nit-picky issues with the book both of which are cosmetic in nature and more an issue of printing than authorship. 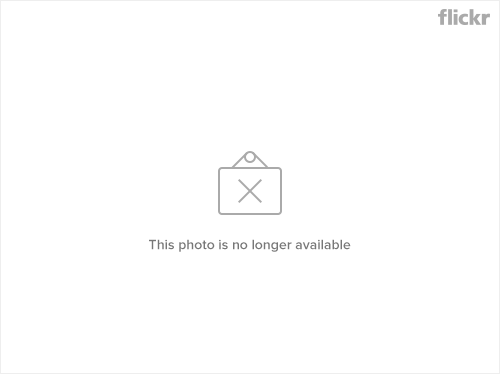 Over the course of 400 photos, there is an occasional difference in brightness between photos that can be a little distracting and there were 2-3 instances where the white printing on the black background was faded to the point of being difficult to read. Neither issue effected my enjoyment of the book, which I rank as my current favorite among the current crop of volumes produced by Lego nerds recently. Coffee table books with pretty photos are nice but I actually feel better informed after reading Assassination! and I’m certainly better armed for any future engagements in American presidential trivia. With a great price-point, solid building and great writing I can’t endorse this informative volume enough, constant reader and I encourage you to purchase the tome at your earliest convenience for yourself or as a gift. Perhaps the best testimonial I can give is that everyone I have shown it to has been unable to put it down without laughing and remarking about one of the factoids. If you have friends who are anything like mine, you’ll soon be refusing to loan it out. Let’s face it, people never return books. 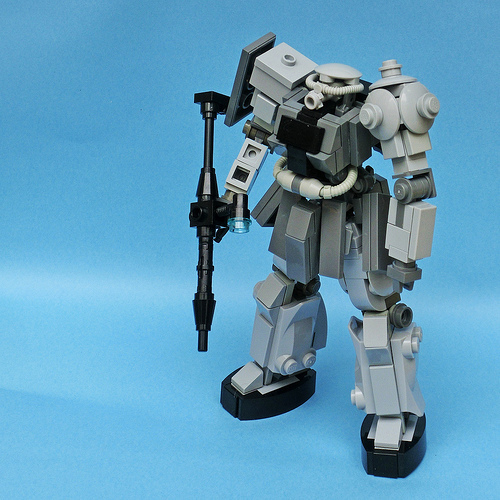 I meant to blog this next model back when it debuted in September, but something shiny must have distracted me from the Titanfall R-101C Assault Rifle by our old associate Nick Jensen (Nick Brick). Working features include: removable magazine, moving trigger, sliding charging handle, flip-up iron sights and a detachable HCOG sight that lights up. 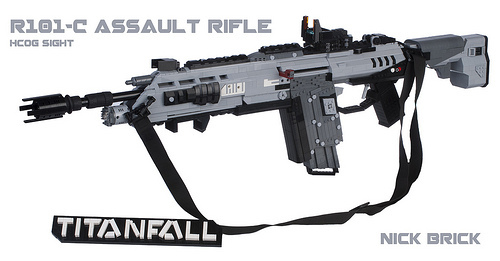 The rifle is a replica of the one used in the video game Titanfall, and purists can breathe easy because even the sling has the lego logo, although the builder does not specify where it comes from. 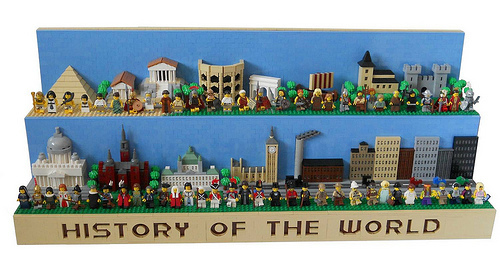 In his latest effort, the simply titled History of the World, Lasse Vestergård has wonderfully combined microscale architecture with collectible minifigs to create a timeline starting with ancient Egypt and ending with modern America. 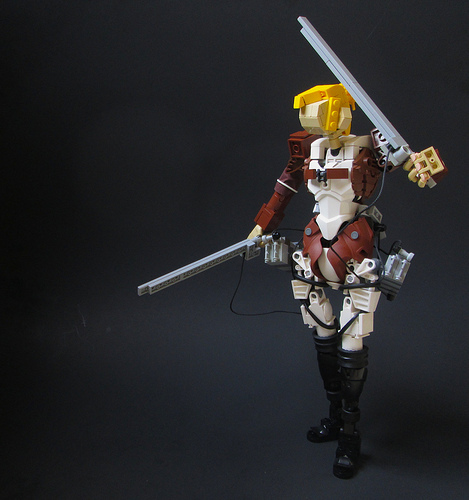 I’ve seen many fellow hobbyists construct brick-built display units for their minifigs but never one with such panache or purpose. 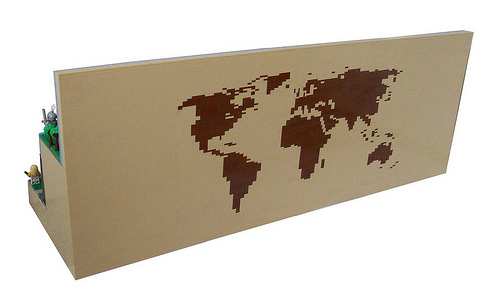 Lasse also took the time to make the back of the display interesting as well, by including a map of the world. “And of course, with the birth of the artist came the inevitable afterbirth… the critic.” My only complaint about this otherwise fine project is with the title, which is a little misleading as the model seems focused on western civilization to the exclusion of the rest of the world. However, when you try and boil down the entirety of human history into a dozen vignettes, you’re bound to leave somebody out. Our chief medical officer here on the Brothership has informed me that our stockpile of hemoglobin is critically low, so please welcome newcomer umamen (uma uma) who brings some fresh blood to this venerable blog. 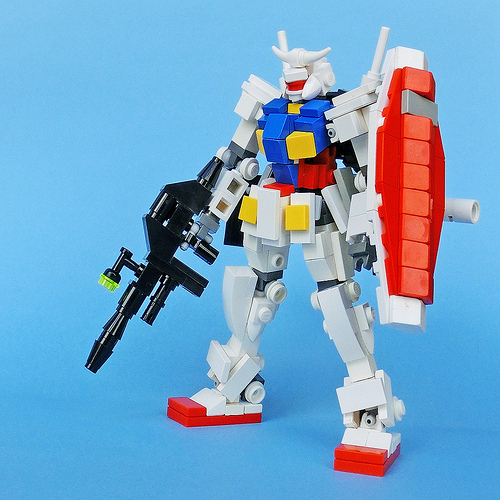 We are proudly presenting a pair of Uma’s mecha for your Sunday viewing pleasure, the Gundam RX-78-2 and the MS-06F ZAKU II which were both inspired by the collected works of Pete Corp.
MOCpages people’s champion matt rountRee just finished his take on the famous zero-G hallway fight scene from 2010’s Inception and it is every bit as eye catching as the film. The expression on Arthur’s face is perfect and the pose of the bad guy makes for an inspired tribute to the trippy scene. If you follow the link you’ll find some interesting commentary about the build and some pulled-back photos that show how extensive the set-up is. 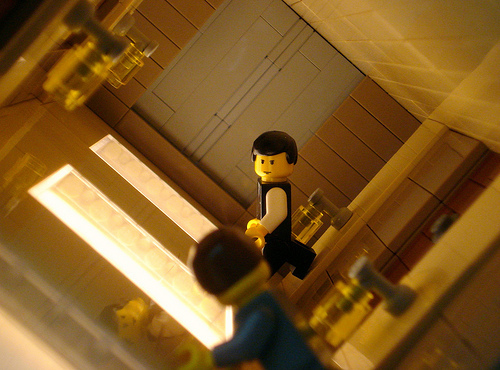 Just for comparison’s sake I’ve included Alex Eylar’s (Profound Whatever) take on the very same scene, in minifig scale, from 2010. 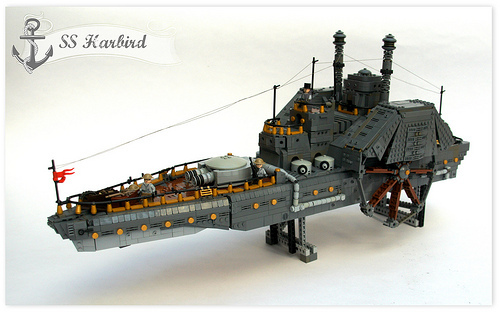 Take to the stars with ice trawler Polynya. sioka sculpting makes his first appearance in the ivy covered halls of TBB with a S.H.I.P. that has just about everything you could ask for: great color control, fine details like hangar bays and life-boats, powerful engines and that hard to define cool factor. One of the reason’s I was attracted to this model was that it simultaneously looks modern and old-school, like the handsome love-child of Dasnewten and Dan Jassim. For you trivia fans, the name polynya refers to an area of open water surrounded by sea ice. It is a Russian term полынья which refers to a natural ice hole, and was adopted in the 19th century by polar explorers to describe navigable portions of the sea. 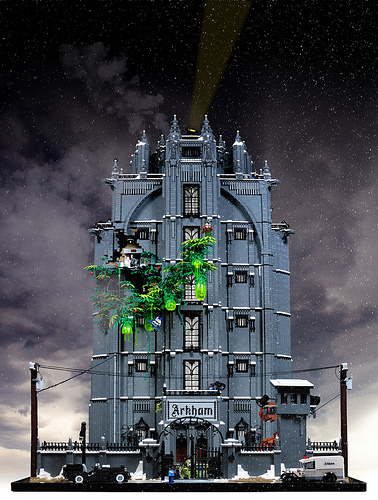 Thorsten Bonsch Xenomurphy has been hard at work for a full year to bring you his latest masterpiece, “Arkham Asylum“. The brooding structure takes its name from the sanatorium in the fictional city of Arkham, Massachusetts, found in many of H.P. Lovecraft’s stories of the macabre. Batman and Lovecraft are both huge influences on Thorsten’s work and a merging of the two has obviously inspired him to greater heights. 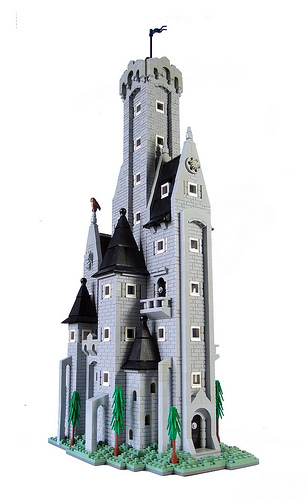 The structure itself is impressive and there is plenty of minifig driven action throughout the diorama to please both fans of Batman and the hot-weather crowd. My favorite detail is the eruption of greenery coming from Poison Ivy’s cell. 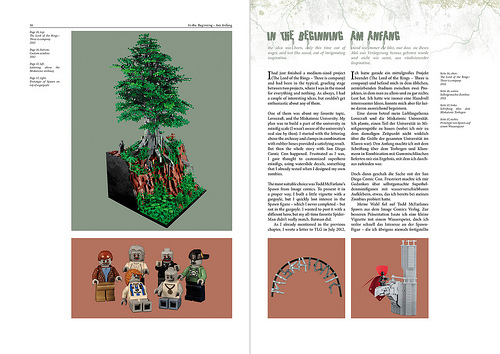 It would be enough for most builders to create such an outstanding model but Thorsten wasn’t satisfied until he’d created an elaborate and striking 82-page “making-of-book” that according to the man himself: “explains every little step“. Indeed every imaginable topic in the design process is covered in great detail from inspiration to minifig selection to the nuts and bolts construction of various sections. The book also details the contributions of builders like Dave Kaleta and Calin who helped set the scene with some amazing 1920’s inspired vehicles. Thorsten obviously put as much care into the layout and writing as he did into the build itself and the result is a rare glimpse into the mind and creative vision of one of our best builders. You can get a sampling of the engaging work in Thorsten’s Photostream on Flickr or he has thoughtfully made the entire document available as a free download. 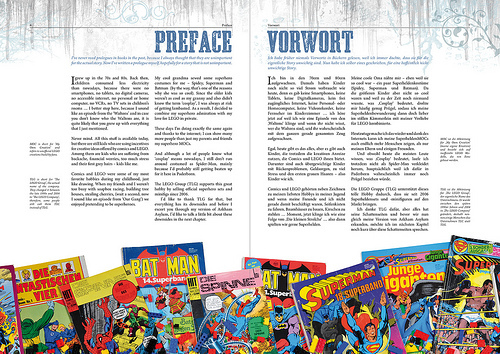 The reader who takes the time will surely be rewarded and immersed in the details of Arkham. 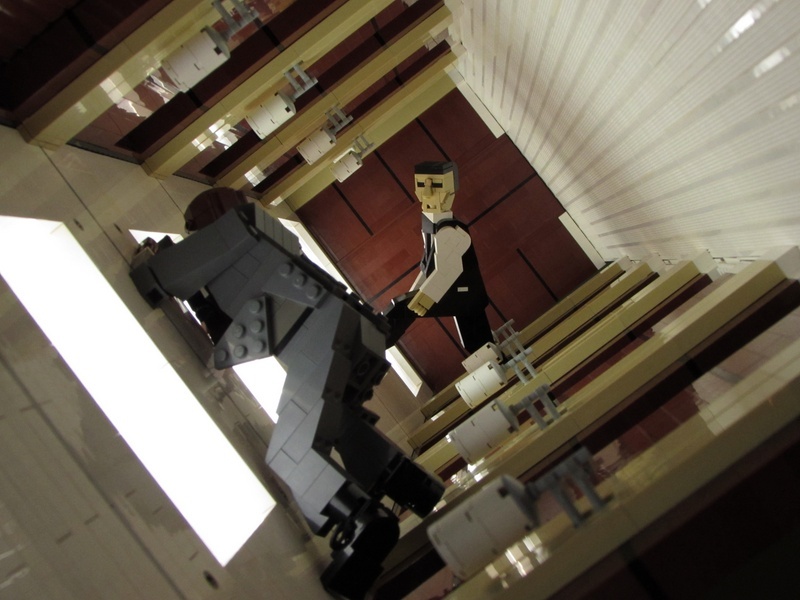 Fighting out of the red corner, from “The Land of Misfit Toys“…Lego_fan and his Lindon Castle. And fighting out of the blue corner, from the 13th American Colony…Magnificent Mark of Falworth and his Aldora castle. As usual, constant reader, you are tasked with deciding the outcome of this pugilistic endeavor by way of comment. On the last edition of Friday Night Fights, the Battle of Hub-14 ended with a magnificent 10-5 victory for Nick Trotta and his purple VTOL with the unpronounceable name. Tune in next week for another action packed edition of Friday Night Fights! 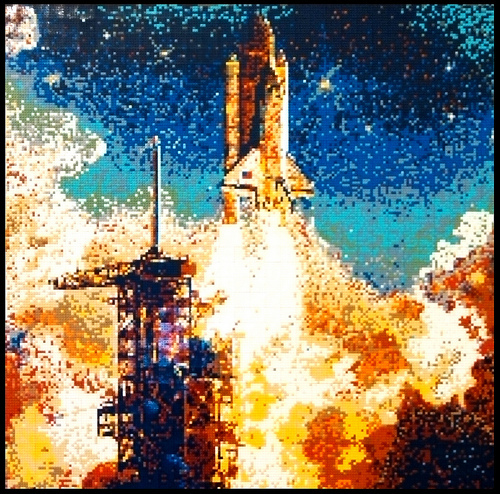 Diamond Dave Shaddix returns to the Brothership with his latest project, a 5’x5′ mosaic based on Robert McCall’s painting, “Sunrise Launch”. The massive undertaking was a community build event hosted at Arizona’s Challenger Space Center with over 600 volunteers put to work applying 37,904 LEGO bricks together to form the eye-catching exhibit. 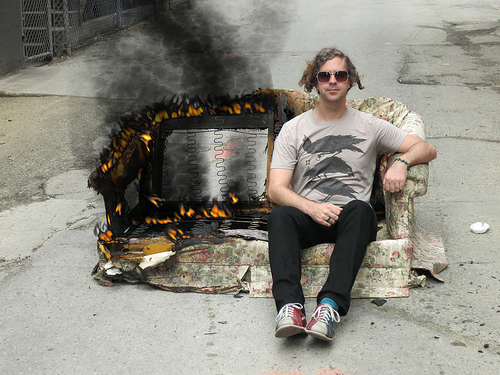 Dave said things went remarkably smoothly and he already has plans in the works for a larger project in 2015. There were also rumors of Dave attaching Estes rocket engines to Lego models, but no photographic evidence remains of the carnage. So if you’re anywhere near Arizona, go check it out!